Pinky up while changing your flat low-pros with the Flat Tire Concierge. Inside a compact storage case is a mat for you to kneel on instead of the dirty ground, a pair of rubber protective gloves so as not to mess up your manicure, and a full-size elastic tire tote or “condom” that will slip over any tire up to 31″ in diameter. $24.95 gets you the Flat Tire Concierge kit. 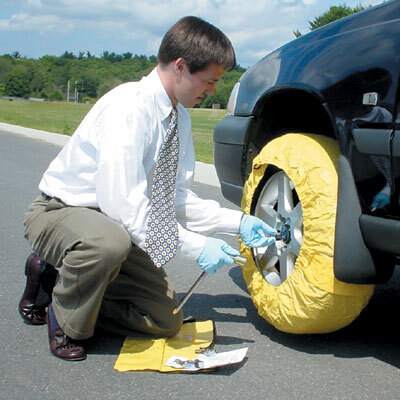 Now you will be able to move and carry that dirty, naughty tire without grime-on-suit-shirt syndrome. Buying that 50 spindle of discs is a pain when you have no easy way to hand them out to friends due to lack of protection. 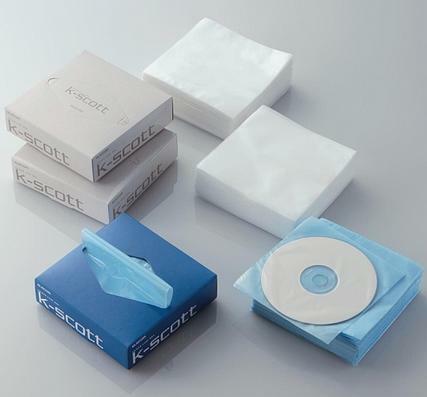 From Elecom, our USB port’s friend, is the K-Scott CD pouch dispenser. Just like a box of tissues, you get snot-proof pop-up cd sleeves that are ready to be used. Available in blue, white, and pink for $7 a pack. A very easy and organized way to keep some of those nifty sleeves from covering your desk. 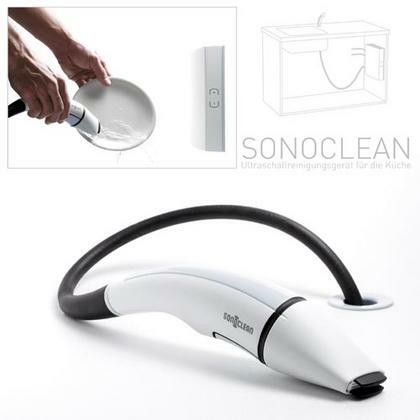 When Tom Cruise and Mr. Clean get together, you get the Sonoclean [Yes, but why? -Ed.]. Until now, this technique has only been used in industrial applications, but this conceptual design by Tobias Berneth brings that to your home. An ultrasound jet sends highly energized sound waves through a spray of water, turning it into a high-tech cleaning machine. It will then be able to clean the surface of an eating implement without the need for any detergent. This is a very good idea, since some of us (such as myself) hate to clean with super hot water for fear of being burned and some people are allergic to the chemicals in soaps. It will also help the environment and such. Of course “concept” means that it’s not for sale anywhere. Yet. 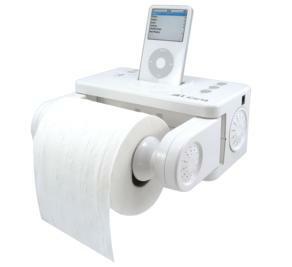 The iCarta is an iPod dock that is also a toilet paper holder. No longer will you be bored in the watercloset as the 4 integrated high performance moisture-free speakers deliver exceptional clarity and high quality sound. Using 2 tweets and 2 woofers to pump out sound, the toilet paper holder arms fold when there isn’t paper, turning the device into a fairly attractive wall mounted speaker. A pretty big unit at 8.25in x 3.68in x 7.12in, it draws its power from an AC plug and thus it can also charge your iPod while it is docked. No information could be found in terms of how much it will cost. Let us know if you could. No it’s not the kind that you can scratch on; the i360 iMac Turntable is actually a lazy susan for your new G5, Intel Core Duo iMacs and 20 and 23inch Apple Cinema Displays. 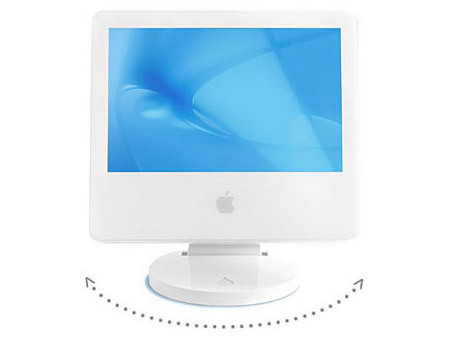 Once installed, this very handy item allows full 360 degree rotation of your monitor, allowing easy access to the connectors on the back or, say, to show a friend a new item on OhGizmo! (hint, hint). There is even a mini picture frame, so you can decorate it with the included icons or make your own. Apparently very heavy, this is good to insure that your new $3k computer will be firmly anchored down despite whirling around. $39.90 gets you the white version (iMac Intel Core Duo & G5) and $44.90 for the aluminum version (Apple Cinema Display). We are all nerds here [No, no, my dear man! We are geeks! World of difference here. -Ed. ], ones that wonder to themselves “How is it possible that the Deathstar can blow apart planets?” Well, one man by the name of Michael Wong answers, with calculus, exactly how much power you would need to do it. You know, to have a Deathstar Laser System. “Alderaan might have been a very tiny planet, so it would have been very easy to destroy”. There is a fairly narrow range of planet types which can support human life. A human-habitable planet must have sufficient gravity to have retained an atmosphere after its formation, so Alderaan simply could not have been an extremely small planet. Furthermore, the Death Star has been explicitly described to be capable of destroying any inhabited planet. By Shikoku88Henro on 06/12/06 • Leave a comment! We are well known in the watch/gadget department around here at OhGizmo. We’re watch-o-philes, if you will. Citizen has taken an idea put forth by Seiko in a prototype and come out with their own, more robust version. The i?VIRT TM is a Bluetooth watch that can hook into your cellphone and act as a caller id screen. Not only that, but it can actually control the phone and do many other functions, such as light up or vibrate when a call is coming in, or even forward or put a call on hold. 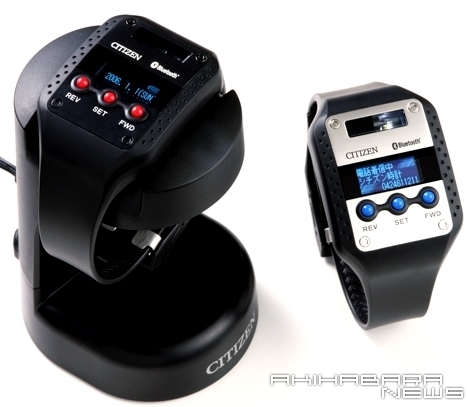 While Seiko has shown the tech, Citizen will actually be releasing it soon to the masses. No word on price but for what it can do, expect it not to be cheap. Here, if you can find it, is the Citizen page [in Japanese] where more details might be had. Adding all the benefits of running bare foot to the protection of wearing shoes, the FiveFingers shoes not only hug the feet, but also separate the toes into their own little “shoes”. 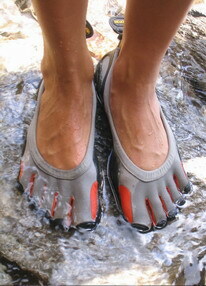 Not only are your feet protected, but the barefoot design adds an element of exercise that regular shoes don’t provide. On the back of the shoe is a convenient pull tab and elastic lock that lets you customize the fit, just like triathalon laces. With a Vibram sole that is almost good forever [personal review, having worn Vibram soled shoes while hiking Shikoku], these are shoes that will last you a good while, and keep you performing at your peak. The reviews have been very positive. Priced around $70 these are pretty cheap compared to other athletic shoes. And most other shoes don’t give you monkey-feet abilities, like curling your toes. By Shikoku88Henro on 06/05/06 • Leave a comment! Helping the trend of the absurd and ritzy is a new anti-thieving, space saving technology for coffins in South Africa. Winning the National Student Innovation competition at Wits University, students designed a pyramid-shaped coffin that employs a chemical indicator sensitive to body odours, which changes the colour of the wood as the body decomposes inside it. Undertakers have been notorious in South Africa for digging up coffins and reselling them. This pretty much solves that problem, what with the customer seeing giant purplish stains all over the box. You are probably wondering how these are ritzy considering they are wooden coffins. Well according to South African culture, only royalty and the upper class in ancient Africa were buried in a squatting position. These coffins emulate that same style not only in a step to increase fanciness but the coffins actually use 66% less space with this design and help with the overcrowding issues they are experiencing in graveyards all around the region. With so many dead they better hope they don’t have a zombie attack.